Reduces RSI: Repetitive strain injuries by reducing stress & strain on the computer user's wrists, forearms, neck, shoulders, back & lumbar region. Reduces eye fatigue: this adjustable computer desk reduces eye fatigue, stress & strain by having a minimum viewing distance from the computer user's eyes to the monitors of 24". Monitor mounts/arms: Review the many monitor mounts/arms/stands at the link below. We offer single, dual, quad an multi monitors mounts. Let us know the manufacturer and model number of your monitors so we can recommend the best monitor arm array. Cable management: Equipped with a cable tray in the rear of the monitor surface. The cable tray conceals and distributes all the wiring required. 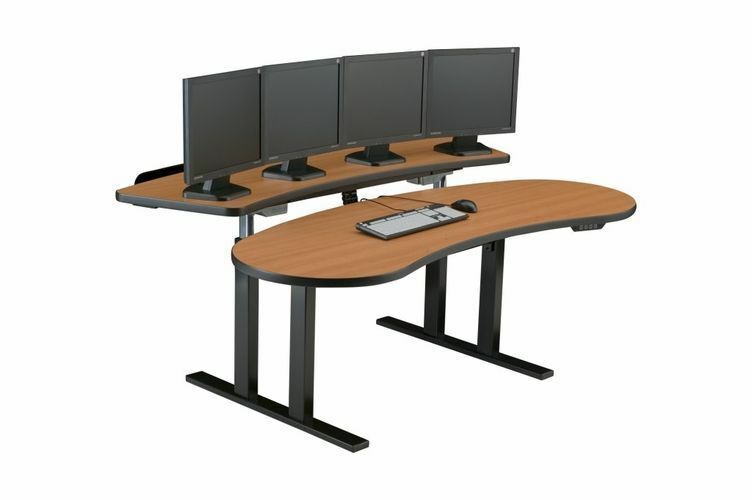 Travel range: This Control Room Desk travel range from 25" to 50" (lifts 350 lbs per surface) using electric motors that automatically level the surfaces as they are adjusted in height. 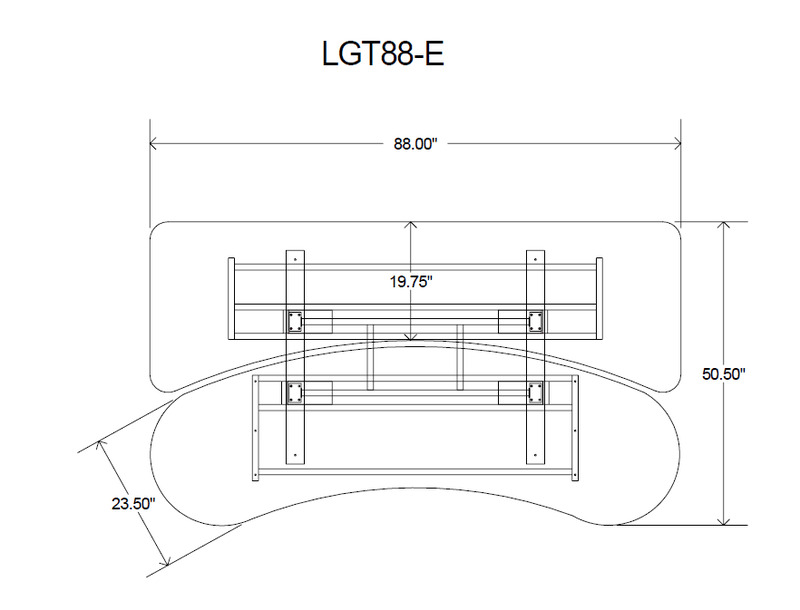 Top Sizes: #LGT dimensions are: Overall: 70"w. X 48 1/2"d. Front top is 70"W. x 23 5/8"d. Back top is 68.25"w. X 19 5/8"d. Installation is not included, but is easy and takes about 45 minutes. Basically all you have to do is attach the two tops to the base and the mounting hardware is included. Free shipping - delivered dock to dock - to the lower 48 contiguous saves you money. 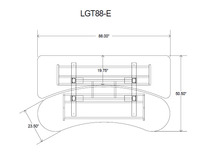 What dock to dock means is this furniture ships an a 53 foot long truck that requires a loading dock that is 48" to 54" high to allow the truck to back up to and, unload. So unless your building has a loading dock 48" to 54" high, you will need to select either Optional Assembly By One Of Our Installers, or Residential Delivery that follows directly below. Optional Assembly By One Of Our Installers. Select above right. Our local installer will receive this at their warehouse, then deliver and assembly at your location in a building that has an elevator. If carry up stairs is required additional charges will apply. Select above right. Optional Residential Delivery. Select above right. If lift gate service is required to load and unload a shipment when loading docks are not available. Inside delivery is available to bring the freight through a door. Inside delivery does not include depalletizing, transport to elevators, or up flights of stairs. The truck driver is not responsible if the freight pallets cannot fit inside doorway(s). Residential delivery will be made to building ground floor entrance, garage entrance or carport. Select above right. ErgonomicHome.com online since 1997 with 40 years of office furniture experience. We are safe, sure, sound, and secure. Questions? Phone home free 1-877-550-2678 or click to email Tom .